For the man (or woman) in black. The white superluminova just pops off the deep, black dial version of the first dual-time Expedition from Vostok-Europe where tone-on-tone is ready for the wilderness, a night on the town or every day at work. 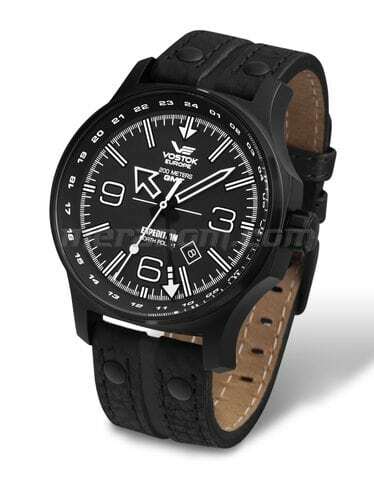 The dual-time Expedition North Pole 1 models from Vost..
Movement: 6S21 Miyota quartz chronograph (battery-operated) Case: Black PVD stainless Steel, 47mm x 18mm thick. 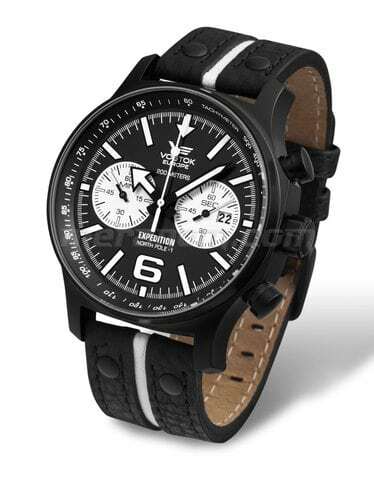 Back: Screw-in back Crystal: Anti-reflective Mineral Band: Black leather strap with blue stripe, buckle closure. 24mm. 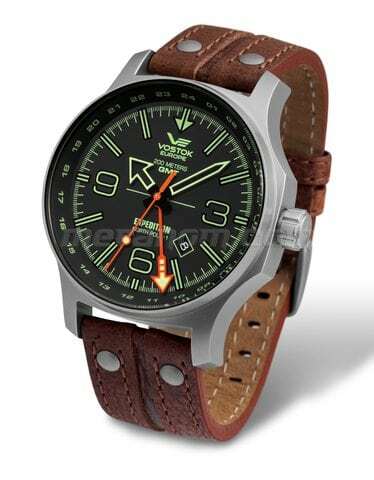 Water Resistant: 200 meters Warranty: 2 Years .. This deep, rich blue dial version of the first dual-time Expedition from Vostok-Europe is an attention grabber against the black PVD case. 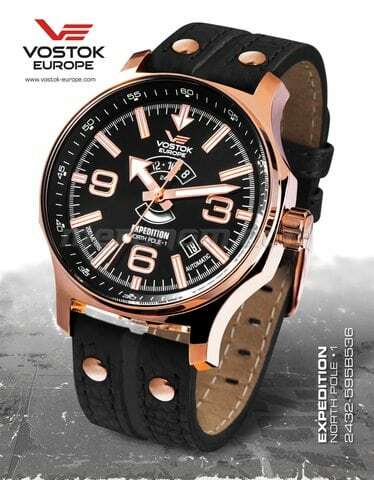 The dual-time Expedition North Pole 1 models from Vostok-Europe bring together the precision of the Swiss Ronda movement with the ruggedness of the Vostok-Eur.. The sand-blasted matte case and charcoal grey dial of the first dual-time Expedition from Vostok-Europe are brought together perfectly with a pop of orange on the hands. 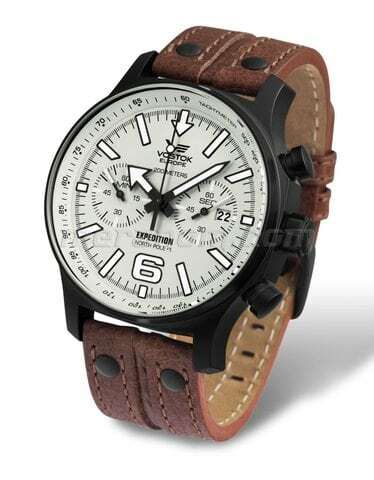 The dual-time Expedition North Pole 1 models from Vostok-Europe bring together the precision of the Swiss Ronda movement with t..
Vostok 2432 Automatic movement with shock resistant balance. 32 ruby jewels. Date of month. Two Color Day & Night Indicator. Central second hand. Frequency: 19800 semi-oscillations per hour. Avarage daily rate: -20...+60 sec. Power reserve at least 31 hours. Superluminova ha..